Big Wong (sometimes referred to as Big Wong King) has been a fixture in New York City’s Chinatown for decades (a picture here from 1978) and has been racking up good reviews the whole time (GrubStreet, SeriousEats, NY Times, Eater). Big Wong has two bare bones, communal dining rooms separated by a wall with a big round hole cut in it. By communal dining, I mean if you come in with a small party you are likely to be seated at a large table with another party. The BBQ Roast Pork and BBQ Pork Ribs at Big Wong are juicy and flavorful and are some of the best I have eaten. The Dumplings: We tried the pork and shrimp wontons in soup with noodles and the steamed pork and shrimp dumplings with oyster sauce. Their wonton soup was awarded “Best Chinese-American Style Runner Up” in Serious Eat’s 2013 round-up of wonton soup. 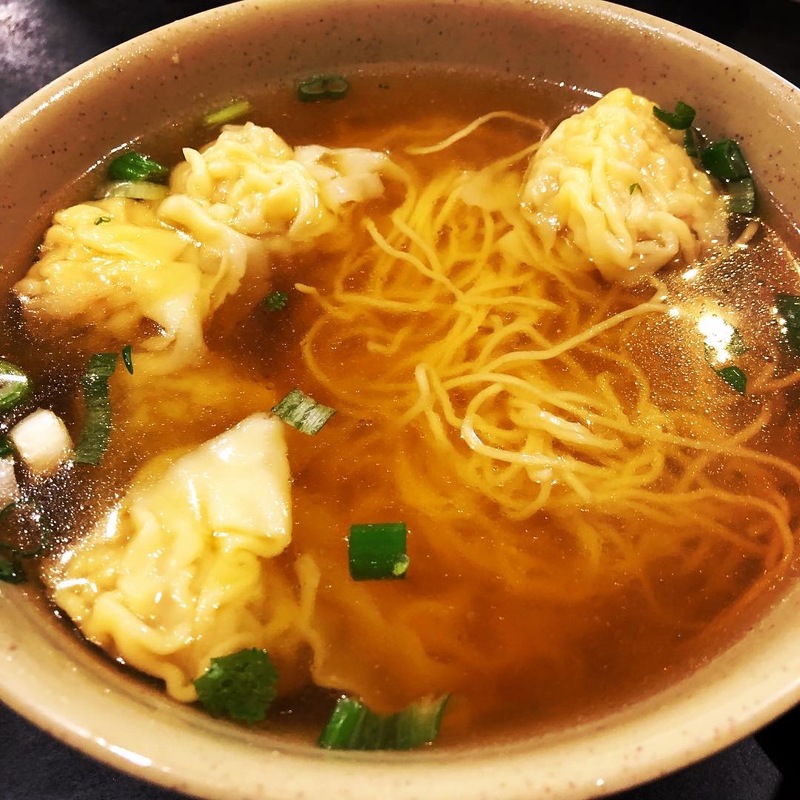 The soup comes with five big wontons and a lot of noodles and easily serves two. The broth has a well balanced pork and chicken flavor with some roasted pork notes. The shrimp in the wontons were sweet and crunchy, signs they are using good, fresh ingredients. The dough wrappers were slightly chewy and had deep wrinkles that the soup and oil clung to. I really enjoyed these wontons. The filling in the steamed pork and shrimp dumpling was identical to that in the wontons and similarly flavorful. 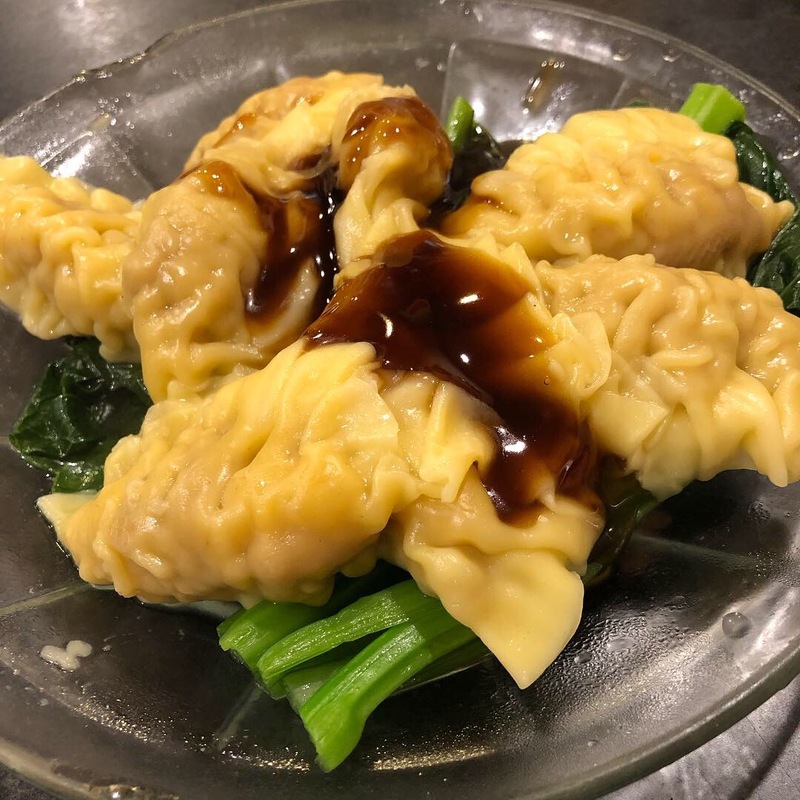 The dumplings were served sitting on top of a layer of Chinese broccoli and were doused with oyster sauce, so you essentially get a small portion of traditional Chinese broccoli with oyster sauce with dumplings. Ordering this dish is a great way to get your greens. The Location: Big Wong is on Mott Street midway between Canal and Bayard Streets in Manhattan’s Chinatown. This entry was posted in Chinese, New York City, Noodles, Pork, Shrimp, Soup, Steamed, Wontons. Bookmark the permalink.